Comfort food. Everyone has their own version. Some people love a big, hot bowl of pasta. Some crave soup. Some can only feel comforted by the cinnamon toast their mom made them as a child. For me, comfort food is anything warm with an Asian flavor profile. Growing up in Manhattan on Chinese food I have fond memories of my family gathered around white takeout containers of sesame noodles, moo shoo something or other, and various other greasy, heavy foods. Despite being an incredibly clean eater now, sometimes I still crave the comfort food of my youth. Recently I have been too tired (pregnant) at the end of the day to make elaborate multi course meals. This Cauliflower Fried Rice is the perfect quick, satisfying dinner for me. I make the cauliflower rice in large batches and chop the vegetable in advance to save me time at night when I am worn out. When it's time for dinner all I have to do is toss it all together and let it steam! My own, much healthier version of Chinese takeout in less than 15 minutes! Chop cauliflower into small florets and process in food processor until “rice like” consistency is achieved. This should only take a few seconds. 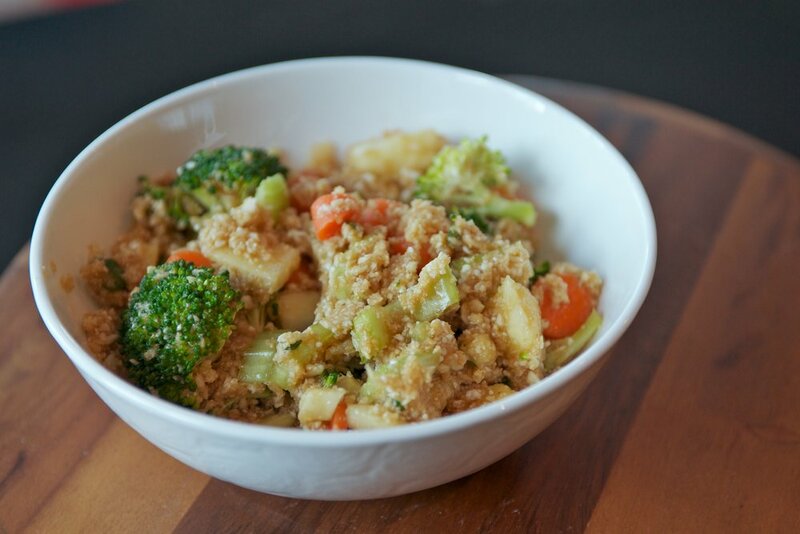 Combine cauliflower “rice” with remaining ingredients and allow to sit for 15-30 minutes for flavor to develop. Place rice mixture in a steamer basket over boiling water and lightly steam until the rice is warm.